13. Lion is known as the king of beasts for his bravery and fighting skills! I do like lions. I believe lions are just such fashionable cats that they decided they needed manes to look good. Ah, lion kings... they are the bestest. We think we are lions sometimes cause we got big ruffs. We like lions a lot! 50-60% of hunts. Never knew that. I wanna be a lion! Happy Fanksgivin'! Ahh, the big big cats, so magnificent. Good info. There has been problems with the Kirschner foundation that I told you about awhile back. They are way out in the country and the people are complaining about them. They say there is to much traffic. Ticks me off cause the cat foundation were there before the people moved around them. They showed some pictures on some of the lions and tigers that they were caring for. They were treating an eye infection on one lion. I pray that they will be able to stay where they are and be able to take care of the big cats. Hi Mr. Omer. It's me, Joey. You haven't blogged in a while, so me and Phoebe and Monica are a little worried. Are you okay? I am the Director of Catpert and we have selected your blog to be in our Cat Blog Directory. 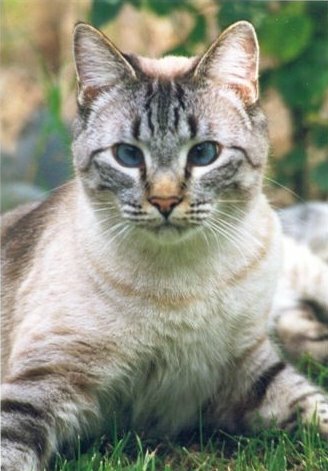 We at Catpert provide expert resources on cats for cat lovers. Recently we launched a Cat Blog Directory. In the process we scanned through hundreds of cat-related blogs, and we thought your blog is one of the more interesting ones out there. Our goal is to connect more cat lovers with cat bloggers, and by adding your blog to our directory we want to do just that. Great post I learned alot about lions. i have a mane like a lion. do you think that i might be related? the new babies are cute...and such a wonderful surprise! I love lions, they are so cute. and fuzzy. but i get afraid of lion so in my thoughts lions are very harmful for every living creature. I am a teaher,i picked a few useful facts on lion,for my lesson plan.Thanks. I love all big cats. male lions are on top of the list. thry r so ferocious and beautiful. ..and great fathers. Question: If a lion or a tiger "sprays" is it 1)marking territory 2) making you a 'pet' or 3)are you food? 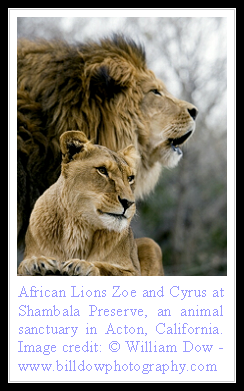 Very nice site on the african lions and other cats. I didn't know there was such a comprehensive blog other than wikipedia on the subject, before I started out writing my own. Great stuff! I really like African lions. Any lions, really. They are such majestic creatures!